Ukrposhta (Ukrainian: Укрпошта) is the national state enterprise of postal service of Ukraine, a member of Universal Postal Union since 1947. It is governed by the Ministry of Infrastructure of Ukraine. It also owns Ukraine's official stamp issuing enterprise "Marka Ukrayiny". 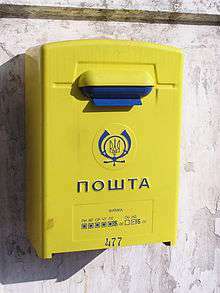 Ukrposhta operates as an independent economic unit since 1994. It also owns the Directorate development of postage stamps (up to November 5, 2008 - publishing house Marka Ukrainy), which produces the official stamps, including custom-made, and other signs of postage Ukraine. The company has several regional and other divisions (directories) spread across the country. The company has its regional departments in each administrative center of a region. It also has its learning center Main Learning Center "Zelena Bucha", directory of postal transportation (DOPP), Avtotransposhta, and informational-accounting service. Main Learning Center "Zelena Bucha"
Since January 2010 the company offers its customers a hybrid mail service as part of its online services. Wikimedia Commons has media related to Post of Ukraine.